We started as a few friends of the Quitzau family wanting to do "something" to help their young son, Calvin, who at age 5 was diagnosed with Duchenne muscular dystrophy, DMD, and have blossomed into a whole "team" of women called The Gals For Cal, helping 20,000 boys diagnosed with Duchenne! In 2009, our inagural year, we brought together 20 women along with Calvin's mother to do our first triathlon together as a team with the purpose of raising awareness and funds for Duchenne research. Most of the Gals had never done any sports related races previously. In fact, most of us were not even athletes and had to learn to swim, bike and run to participate! In 2010, we grew our team to 50 Gals and added 2 mothers of young sons with DMD. By 2011, we had competed in our 3rd triathlon as a team with 85 amazing women racing together against Duchenne! Since then we have proudly been joined by several more mothers of sons with Duchenne and many other women who share our passion to challenge ourselves while also challenge Duchenne. With the tremendous support of our sponsors and donors, we are proud and very grateful to say we have raised over a half million dollars for the fight against Duchenne! 2017 was one of our most exciting years yet as we took on greater personal physical challenges and continue to grow the largest all women's triathlon team dedicated to TRI-ing to END DUCHENNE! As we competed in our 9th annual triathlon together in the Title 9 all Women's triathlon in Hopkinton, MA, we proudly once again raised funds to support Duchenne research and advocacy as well as another new initiative of the Jett Foundation, the Jett Giving Fund. This fund directly assists those living with Duchenne so they may afford the very expensive equipment they need that insurance often doesn't pay for. Our goal is to improve the quality of life for those living with Duchenne. For more information on the Jett Giving Fund, please visit jettfoundation.org. The Gals are stronger than ever and are preparing now to take on 2018! Meet Calvin. Calvin is now 15 years old. He is an adorable boy who is witty, talkative, and friendly. He is the first born of triplet siblings--being one minute older than his brother and sister is a position he takes seriously! Calvin inspires us because he never complains about his growing struggles and doesn't want special attention. Each day, some of Calvin's muscles are dying and at age 12 he lost the ability to walk and now relies on a power wheelchair to get around. As the disease is progressive, he now needs help just brushing his own teeth, dressing and feeding himself and even picking up a book to read has become impossible for him to do alone. The typical course of Duchenne also affects respiratory function and since the heart is a muscle too, eventually Cal's heart will fail. Most boys with Duchenne do not live past their teens or twenties. Cal's daily struggles are growing, yet he is always upbeat and finds humor in just about everything. After a day of sledding and snowmobiling, Calvin exclaimed, "Yeah, I'm livin' large!" Calvin, YOU inspire us to "live large" everyday and help make a difference in the lives of the 20,000 boys living with Duchenne! We are raising funds to support Duchenne research, advocacy, adaptive recreation opportunities and equipment for daily living thru support of the Jett Foundation, a registered 501(c)3 non-profit organization located in Kingston, MA. Your secure online donation may be made by simply clicking on the DONATE NOW button at the top of this page. Your tax deductible donation in the form of a check may be made payable to Jett Foundation. 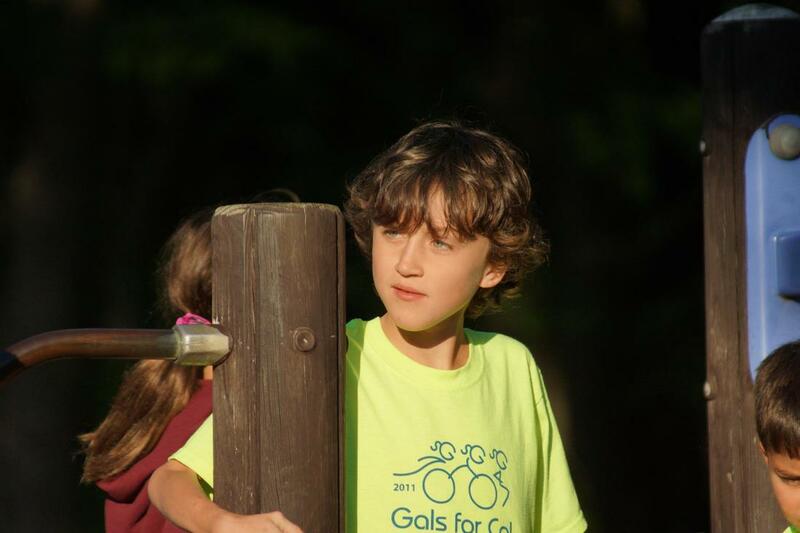 Please write Gals For Cal in the Memo field and mail to Jett Foundation, 68 Evergreen St. Suite One, Kingston, Ma. 02364. The Gals thank you for your support! We could not accomplish these goals without you! ​She swims, she rides, she runs, she rocks DMD!